Looking for a Notary? One of my specialties that I offer the general public are my mobile Notary services. There are many times you just need to have legal documents signed and witnessed by a Notary. I'm happy to provide this service. 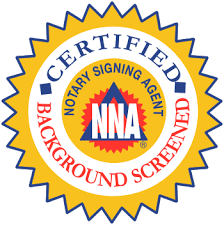 I am NNA Certified (National Notary Association) and can travel to your location in Lexington KY (Fayette County) or we can make arrangements to meet in a public place like a restaurant or coffee house. Also, can travel to your home, office, Hospice, hospital, Nursing home or court house. Its fast and EZ to arrange. Rates and times can be discussed. Just call 859-979-2834 and leave a message as to the type of signing and where you are located in Lexington KY. I will get back to you right away and see if I can get the signing taken care of for you.